As a child when I was sick, upset, or generally out of sorts; my Irish Nana would brew a fresh pot of tea. Then she would fix me a special cup, load with sugar and milk. Whatever was wrong was quickly fixed and I always felt much better with my milky, sweet, Irish Tea! As I grew older, the tea had much less sugar and milk, but Nana’s special tea was the best tea I ever had. 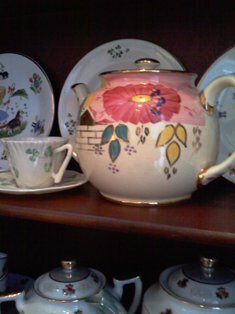 I still have Nana’s tea pot and on special occasions I make a pot of tea, but it is not the same! Problems and solutions are not resolved as quickly these days, but a refreshing cup of tea always calms the soul and things do not seem so bad while sipping a nice cup of tea. Fill a kettle with freshly drawn water; reheating water already in the kettle will affect the taste. Heat an earthenware or china tea pot. Put hot water in the pot for a few minutes this is called warming the pot. Use 1 teaspoonful of tea per person plus 1 for the pot. Take the pot to the kettle and pour freshly boiling water over the leaves. Leave tea pot steep for a few minutes and stir, after another 2 minutes tea is ready to pour, but no more than 5 minutes after adding boiling water. If you don’t have loose tea, you can use tea bags in place of loose tea; it is your choice. Now to really move you from FRAZZLED TO DAZZLED, my tag line, I found a different variation of the tea above; by replacing milk and add Bailey’s® Irish Cream liquor! I really feel that my Nana would have probably enjoyed this version for a special occassion. I tried making a pot of tea with the recipe above, without the Bailey’s® Irish Cream liquor, and it was good but not quite like Nana’s. Why? It’s hard to say but it is probably because I made it and not Nana! She was the magic ingrediant that made the tea so special and it calmed my soul. So if you are uptight and need to have a little calming of your soul brew yourself a cup of tea and just relax and enjoy! Love this. Brings back memories of my English Grandmother and her tea. Thanks, Claire!